Ramazan, 97 years old at the time, spoke with Azerbaijan International's editor, Betty Blair, while providing a tour of the Uzeyir Hajibeyov Home Museum in Baku. He had been its Director since it opened 20 years earlier. Fuad Akhundov, a friend of the late Ramazan facilitated the meeting and did the translation. Ramazan died in 1999. And what happened to that house? We don't know for sure, but they say it has been burned. Professor Mammad Gaziyev and I helped open the Hajibeyov Museum in Shusha in 1959. And there, as well, we preserved everything as it had been when Uzeyir Hajibeyov had been living there. So the Home Museum in Shusha was opened before the one in Baku? Yes. Even though the government adopted a decree on February 19, 1949, to open Hajibeyov's museum, four months after his death, the task of founding the museum was delayed for many long years. Finally, the museum in Baku was opened on November 20, 1975, thanks to Heydar Aliyev, who had come into power. As soon as Aliyev became First Secretary here in Azerbaijan, he made it possible to found Home Museums for composer Uzeyir Hajibeyov, poet Samad Vurghun, playwright Jafar Jabbarli, statesman Nariman Narimanov and a number of other well-known people. The leaders who had preceded him didn't pay much attention to these matters. In fact, some of them were known to have said, "Let the dead wait." 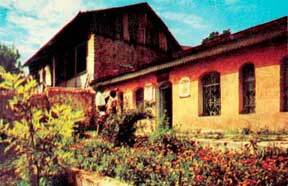 Photo: Hajibeyov Home Museum in Shusha before Armenian occupation of Karabakh in 1992. Why was Heydar Aliyev so interested in popularizing Hajibeyov's legacy? Because he is a highly cultured man and was able to think like a statesman. He understood that without centers like this, it is impossible to develop our culture. People have to know the history of their culture. Heydar Aliyev personally participated in the opening ceremony for this museum. We have a photo here showing him opening the museum. Photo: Last photo of Uzeyir Hajibeyov and his wife Maleyka a few days before he passed away in 1948. Photo by Ramazan Khalilov. Was Uzeyir Hajibeyov's father involved in music? Frankly speaking, the town of Shusha is like a large music conservatory. It's as impossible to imagine Shusha without music as it is to imagine Italy without music. Actually, it was Uzeyir Hajibeyov's mother who was very musical. His father was a well-educated man, familiar with the classics, literature and poetry. And he was the personal assistant to the well-known Azerbaijani poetess Khurshud Banu Natavan, who lived in Shusha. Uzeyir Hajibeyov received his musical education in the Pedagogical Seminary in Gory, Georgia. The seminary was essentially a secondary school that offered a wide range of subjects. Along with the usual traditional classes, the school offered special classes in basic medicine, where students were trained to render first aid in remote rural areas, where most of them were living. More often than not, doctors were not available there. The school also offered basic education in botany, gardening and many other practical subjects as well as a wide range of musical studies. It was also involved with teacher preparation. But it was the music classes that had a profound effect upon Hajibeyov. As a student, he studied the violin. Photo: Inside the Uzeyir Hajibeyov Home Museum in Baku. How did he get from Shusha to Gory? After he finished school in Shusha, he really wanted to continue his education. He was 14 years old when he left for Gory. Did they teach in Russian or Georgian? Russian. But Georgian and Azeri were also taught. Uzeyir Hajibeyov was fluent in Georgian. He always got "5" (A) marks in his Georgian classes. His Georgian teacher was the famous Georgian writer Nikola Lomauri. While at Gory, Hajibeyov was already playing in both the symphonic orchestra and the brass band. This shows what a broad range of musical education he received there. They also taught music theory there. Hajibeyov went on to introduce traditional folk instruments into the European symphonic orchestra to join the violins, violas and other instruments, didn't he? That was his own innovation. The tar, kamancha and zurna were the first three traditional Azerbaijani folk instruments that he introduced into the orchestra. It was a very bold experiment and even Stalin noticed it. This synthesis was an entirely new way, a new approach to music. All of the mass media were writing about it and noting how important an experiment it was. This experiment is particularly evident in his opera "Koroghlu." Was there a lot of resistance to this idea? What other kinds of influences did Hajibeyov have on contemporary music? Uzeyir Hajibeyov's musical legacy influenced the entire nation, including our progressive musicians. But there were also some tendencies like dissonance. Some people wanted such music to become the predominant force in our music. And this tendency had a lot of supporters in our country. Russian composer Shostakovich and his followers led this avant-garde movement. But later on, Shostakovich became more and more realistic because he realized that this tendency was anti-national, and that it was impossible to force people to perceive music in these ways. Hajibeyov was very popular and deeply respected in the Soviet Union, thanks to the fact that his creation and his music were very close to people. And he had innovative methods. This is probably what gained him credibility and respect all over the Soviet Union. 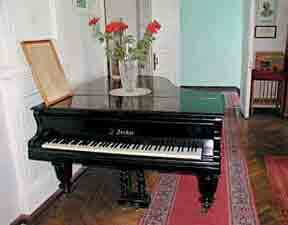 He was one of the foremost composers in the entire Soviet Union. He was the first composer in the whole USSR to be awarded the highest recognition as "People's Artist of the USSR". And he was the first Soviet composer to be awarded the Lenin Order (1938 for "Koroghlu"). Armenian composer Aram Khachaturian was second in the USSR to be awarded Lenin Order. Dzerzhinsky was also awarded the Lenin Order. He composed the first Soviet opera, which he called "Silent Don", the first to be based on a Soviet theme. Marian Kaval composed the opera "Yemelyan Pugachov." Hajibeyov was a member of the Presidium of the Union of Composers of the USSR, a deputy of the Supreme Soviet of the USSR, a member of the Artistic Council of All-Union Committee for Matters connected with the Arts, and also a member of Stalin's Committee. The chairman of the Artistic Council of the Ministry of Culture of the USSR. At the time, this Ministry was called the All-Union Committee for the Arts was Nimerovich Danshenko. This organization dealt with all types of art. Uzeyir Hajibeyov was considered to be one of the leading composers in the USSR. There is an interesting friendly caricature that features all of the Soviet composers who wrote operas about Soviet topics, including Sergei Prokofiev ("Simon Katkov"), Dmitri Kabalevsky ("Kologrunyon"), Chichkov, Potyomkin, Dzerzhinksy, Vlasov, Ferre, Tikhin Khrenikov, Gleyer and Yuri Shaporin. This caricature was based on the famous painting "Burlaki" (Barge Haulers) by Repin. Burlaks (barge haulers) were very strong people who walked along the riverbanks pulling the boats through the shallow rivers when they couldn't navigate by themselves. So people used to pull the barges like horses. And in this caricature, the man leading the group is Uzeyir Hajibeyov, holding a stringed folk instrument, tar in his hands. The artist of this caricature was Professor Aleksich. It was published in a lot of publications. That was 1940. I wrote a letter to Aleksich, asking him what had inspired him to draw this caricature, and what he had meant by it. He replied that he was inspired by the fact that Hajibeyov's work "Koroghlu" was considered to be the best opera in the USSR. Every single item in this museum has its own unique history. 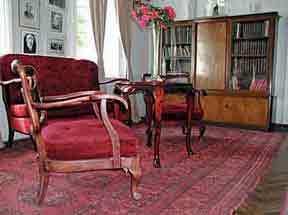 This carpet with the portrait of Hajibeyov here on the wall was woven within 24 days. It's very unique. At that time, there had never been a case in which such a large carpet was woven so quickly. The time was limited, and they wanted to finish this carpet in time for Uzeyir Hajibeyov's 60th Jubilee. I organized all that. When the women who were weaving the carpet found out that the carpet was for Uzeyir Hajibeyov's jubilee, they decided to work three shifts. I brought them all kinds of food so they wouldn't have to stop work to go home to eat. When was Hajibeyov's first opera, was that 1908? His first opera "Leyli and Majnun" was first staged on January 12, 1908. But he had worked very hard on it for many years. "Leyli and Majnun" was the first opera in the Moslem world. It was created in a very untraditional way. 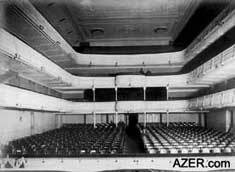 Above: (left to right) Interior of Baku's first Drama Theater, built by Taghiyev in 1885, View facing the stage, and left, view from the stage. I had the opportunity to talk with Uzeyir Hajibeyov frankly over a long period of time throughout his life. Once I asked him: "Why did you choose this different style for composing an opera?" He replied: "You know, I was hesitating and thinking about it a lot. I could have gone in the typical European direction. But I was afraid that if I did that, I would spoil the entire work. So, whether I wanted to or not, I had to improvise on my own and create something brand new." And he really did it. Because it was an operatic work, but not in the traditional sense. It is an Oriental opera. The interesting thing was that the musical part of the opera was performed by the symphonic musical instruments (violins, violas, etc.) on one side and the folk musical instruments (tar, zurna, etc.) on the other. He combined them both. Another very interesting fact is that Uzeyir Hajibeyov wanted his friend Abdurrahim bey Hagverdiyev to conduct the premiere of this opera. Uzeyir himself played one of the violins in the orchestra. He had also persuaded many of his friends that had studied with him at Gory Seminary to play in the orchestra. The second time that "Leyli and Majnun" was performed, Uzeyir conducted. The first performance of "Leyli and Majnun" in 1908 was a great success. People came from quite some distance to watch it. There were hardly enough tickets for everybody. I happened to attend the premiere myself. I was eight at the time. It was staged at the Taghiyev Musical Comedy Theater, which is currently being rebuilt [reopened in 1998]. What I always remember about the premiere of the first opera is this. We were sitting in box seats. I noticed that not a single woman was sitting on the first level. At that time, women all had to wear chadors [veils]; they weren't allowed to show their faces. But the seats on the second, third and fourth tiers had nets draped over them-nets like the ones that fishermen use. I noticed that and asked why there was a black net hanging down in front of the boxes. My mother and some other friends and relatives of our family were attending the performance as well. They told me: "The nets have been put there so that the women who are sitting behind them can't be seen." I protested, saying that I could hardly see anything on the stage. But those nets remained there for long, long years. So when did they come down? During the Soviet period [late 1920s], when women finally got the opportunity to take off the chador, when they were able to burn them. The Soviets deserve the credit for that. When he was only four years old, Uzeyir Hajibeyov is said to have asked his mother, Shirin khanim: "Mom, you're such a beautiful woman. Why are you wearing this rag [veil]?" It's worth mentioning that "the main red thread" running throughout Uzeyir Hajibeyov's life was the struggle for women's emancipation. It was one of the basic directions of his own creative energy. Uzeyir was naturally talented in so many ways. Since his childhood years, he had a keen sense of humor. At age 11, he wrote a book of short humorous stories. And after his first opera, he wrote the musical comedy, "Husband and Wife", where he is poking fun on the chador and satirizing. As you know, the Moslems had the right of polygamy, so the plot of the opera is that the wife, using the chador, marries her husband a second time. It was only the husband's right to unveil his wife's face. When he lifts her veil, he discovers that his new bride is really his old wife. Myself, I'm not a musician, but I was very deeply involved and interested in musical literature. I know many composers of the world and would study them very often. Frankly speaking, I didn't find any other composer that I could compare to Uzeyir Hajibeyov. On one hand, you have lyric, dramatic and heroic operas. On the other hand, you have a deep sense of humor and musical comedies. After "Husband and Wife", he wrote another opera. This time, he decided to base it entirely on a pure European style, with traditional arias, musical recitals and a symphonic orchestra without folk instruments. 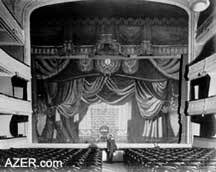 At that time, we didn't have an opera theater that could perform it. So what did he do? He went to the Jewish synagogue and invited its choir to perform his new opera. It was called "Sheikh Sanan". It was a purely European opera in every sense of the word. But the plot was like an atomic bomb for that time. What he was advocating in this opera was free love without national boundaries and religious restrictions, just free love. That was 1909. Let me describe the plot to you briefly. The sheikh was a religious figure who was on a pilgrimage to a sacred place. On his journey, he passed through Georgia and met a Georgian beauty. She was a swineherd's daughter. When the sheikh saw her, she was taking care of swine. (The pig is a forbidden animal in Islam but acceptable to Christians, in this case Georgians.) Nevertheless, he falls in love with her. Now, the sheikh was accompanied on this pilgrimage by some of his disciples. In the end, he denies his religion for the sake of the woman and decides to marry her. Both the religious disciples as well as the woman's parents go after them. Actually, the story is based on a legend in the region. So, while trying to escape, they cross the river Kur and hide themselves in a cave in the mountains near Tbilisi. And so this beloved couple remains in the cave. During the premiere of this opera, people already knew the storyline and a number of representatives from various nationalities - Russian, Jews as well as Azerbaijanis - attended that first performance of "Sheikh Sanan". The Azerbaijani spectators stood up right in the middle of the performance and walked out of the theater. But the rest of the audience remained. Later, the Russian media wrote that it was a wonderful opera with charming music. But Uzeyir bey understood that he had outstripped his generation. The ideas were too advanced for his time. And so Hajibeyov burned the opera. Once I asked him: "How is it that you destroyed that opera?" He answered me: "I had gone ahead too much. My people were not ready to comprehend this opera yet." "But why did you have to destroy it?" I persisted. Actually I was the only person with whom he was so frank. He told me, "I didn't destroy my opera. It was my opera and it is still in my head." And so it turns out that used much of that same magnificent music for "Koroghlu" [Son of a Blind Man, 1937]. This is just a short story of his creative activity. His wife, Maleyka Teregulova, was an excellent teacher. The Teregulov family was famous for being wonderful teachers. There were five or six great teachers and educators from this family. One of the directors of Taghiyev's Female Boarding School was Rahila khanim Teregulova, Maleyka's cousin. I should also tell you that I took most of the photos here in the Museum. They are not professional, but they were taken with heart. Yes, I was. This one was taken in 1947 when he was already ill. He had diabetes. He was not treated correctly. Now when I analyze and reflect on what happened at that time, I have reached the conclusion that he died prematurely. His doctor was Osipyan, an Armenian. What was wrong with his treatment? I'll tell you. I have some understanding of medicine because I myself studied at the Medical Institute for quite some time-that is, until we had to dissect corpses. That's why I ran away from medicine. My brother was a doctor. Even though I quit the institute, I was always interested in medicine and tried to read some of the medical literature that my brother had. In my opinion, Uzeyir had non-malignant diabetes [Type II, maturity onset]. His wife and I tried to look after him very diligently. For example, he loved sweet tea, so we used to give him tea with a sugar substitute, not sugar itself. But he never knew about it. And in order to cheat him, we would put a little lump of sugar into the tea in front of his eyes. He would stir the tea and then turn to his wife and say: "Maleykashka (Maleyka jan), it seems the sugar has lost its sweetness." She would reply: "Oh, yes. You know, now they are producing such sugar. What can we do?" He never knew that we were putting sugar substitute into his tea. This way we were making sure that his health was well regulated. Usually when he would go to Moscow to participate in sessions of the Supreme Soviet, of which he was a deputy [like a Member of Parliament], either his wife or I would accompany him. And we would try to help him adhere to his special diet. But in 1947, due to the fact that there was not enough room in the hotels, no one was allowed to accompany him-neither his wife nor me. When he returned from Moscow after the session was over, he was very ill. His diabetes had become aggravated. He had not taken care of his health and his blood sugar level had become very high. He was immediately hospitalized and the doctor started giving him insulin injections. Prior to that, he had never been treated by insulin. His doctor Osipyan put him on a very strict diet: no bread, no rice, no potatoes, nothing made of flour. So he lost 17 kilos of weight. And when the committee of doctors gathered to discuss his health, I stood up and said: "There is a new method of treating diabetes now. If the patient is being treated by insulin, he can eat whatever he likes. He can live without following any diet." It was a new way of treating diabetes that I had just been reading about in a medical book. But Osipyan replied: "This is an experiment and we don't have the right to try such an experiment on Hajibeyov." Hajibeyov had had a very healthy heart. But due to the fact that he lost 17 kilos, the muscles of his heart became weak and because of this he developed heart disease. What are some other progressive ideas that Hajibeyov initiated? Once he wrote a letter to the government saying that without professional musical education, we wouldn't be able to develop our musical culture. All the performers that took part in his first operas [1908-1915] were just ordinary people, amateurs. The first thing that he did during the Soviet period was help to establish music schools, starting in the primary and secondary grades and then leading up to the most advanced: the Conservatory of Music. Now it's called the Academy of Music and is named after Uzeyir Hajibeyov, an honor that he deserves. Another of his progressive actions was creating the first Azerbaijani String Quartet. He created various musical collectives and groups. Traditionally, Azerbaijani music only used melody. Hajibeyov wrote harmony for the various ranges of voices in his choirs - no doubt an influence from his early days in Georgia, where choirs are a tradition. He created the first national chorus, which sang a cappella and still exists today. He created the first orchestra of folk instruments. Rather than playing only from ear or memory, as was the tradition, the performers relied on written notes. Yes, previously all these folk musicians playing traditional instruments would improvise. But he created an orchestra of folk instruments that played together like an orchestra, with notes. This enabled them to play both national pieces as well as European classical music on their folk instruments. Clearly, all of Hajibeyov's works were innovative steps forward. Were some of his themes with operas and musicals still rather progressive and challenging the Soviet system? He followed his own path, his own inclinations. He had his own way of doing things, and officials never interfered with him because he was never involved in politics. I'd have to admit that despite the fact that he was so brilliant in so many things, he had one little fault. We have an expression: "Every beauty has her own fault." His greatest fault was that he wrote all his pieces and never made any contracts. These days, composers make contracts and demand money even before they finish the work. But he just wrote his works and gave them to musicians and said: "Go, perform it." That's why so many of his original works have been gathered by a number of people. I have been leading the Music Fund of the Republic for the past 25 years, and I know each composer inside out - all the secrets of their lives. Even the most undistinguished composer asks that a copy be made for the Fund and the original be given back to him. They give a copy to the Fund and always preserved the original for the future, for the sake of history. But Uzeyir Hajibeyov would write his work and just pass it out to the musicians to perform. I guess this is also a characteristic feature of a great composer. So you don't have any original works here? We have very few of them. We keep looking for them. One of the basic tasks of our museum is to find out where they are. I'll tell you that he wrote the opera "Koroghlu" just to satisfy his own heart. There were no contracts for that opera. He finished this opera and just passed it out to musicians to perform. That was 1937. Ten years later in 1947, the person who was in charge of affairs related to copyright called Uzeyir Hajibeyov and asked him: "Uzeyir bey, there is a special decree by the government that any work that has been performed on stage for ten years can be compensated a second time for the same amount of money according to the contract." Uzeyir bey answered: "How much do I get if I don't have any contract?" So we all started looking for a contract. But we didn't find any because none had ever been drawn up. So he didn't get anything? Nothing. He used to get honorariums. But now I know of composers who signed contracts but wrote nothing. Uzeyir bey led a very modest life. He was a great philanthropist, and because of him, a lot of young people from here received their education in Moscow and St. Petersburg. And there were pensioners, elderly musicians to whom he would give some subsidies every month. He was extremely generous, but personally he was very modest. I'll tell you a very interesting story. There were a lot of cases like this, but this one is very interesting. We were in Moscow during one of the sessions of the Supreme Soviet. When we arrived in Moscow, a lot of students and people would always come to visit him. There were about 15 students there at the time. He would ask them individually how they were getting along, working and studying. Then he left for the Supreme Session. Frankly speaking, he was also very talented in languages. He knew Azeri perfectly well, but he also knew Russian, Persian, Turkish, Arabic, Georgian and Tatar. To keep the students from catching on, he would secretly tell me in Tatar to give each of them 500 rubles. (My mother is Tatar, my father, Avarian.) Whenever I speak about my own origins, I say: "My father is Avar, my mother is Tatar and my Motherland is Azerbaijan." So he told me to give each of them 500 rubles. Then he left. I distributed 7,500 rubles among those 15 students, giving 500 rubles to each. It was a large amount of money for that time, equivalent maybe to today's $10,000. The money was distributed, the students put their signatures on a list and left happily. Then Uzeyir bey came back from the Session and we went to a restaurant for dinner. Because we were relatives (his wife's mother and my mother were sisters) and close friends, I could speak to him about anything. Nobody would have dared to ask him the kinds of questions that I did. Sometimes I would even argue with him. So we went to the restaurant, sat down at a table and asked for the menu. He said: "I'd like to have some caviar." He took the menu and saw that 100 grams of it cost 3.5 rubles. But he refused to order it. "No, this is too expensive." I got angry and told him: "Uzeyir bey, you are such a strange person. You just gave away 7,500 rubles among the students. But you won't spend 3.5 rubles for yourself. Order the caviar and I'll pay for it." He got very angry with me. Whenever he got angry with me, he would always say: "Eh, you don't understand anything, man." And I said: "What is there to understand here? You just gave away 7,500 rubles and won't spend 3.5 rubles for yourself." Then he explained the logic behind his refusal: "When I was studying in Moscow and St. Petersburg , I was living a very difficult life and was in such desperate need. There were times when I couldn't find enough money for bread. That's why I'm doing my best to help these students, so that they won't feel all those difficulties that I went through." That's how modest he was. He didn't have children, did he? No, he didn't have any kids. He used to say that his kids were his works. And he was very generous when it came to money. He would get his salary at the Music Conservatory and by the time he went home, he would have only 3, 5 or 10 rubles in his pocket. His wife was as kind as he was. She never asked him where he spent all his money. There were some low-paid technical workers, and he would give them money from his own salary. He was such a generous and open-hearted person. He used to say: "I have nobody to preserve my inheritance for." Uzeyir Hajibeyov was never interested in getting anything from anybody. He would receive expensive gifts, but he was never very interested in them, just appreciative to those who had given him those gifts. For example, he was given a silver vase that weighed 4.5 kilos and has scenes from his works embossed on it, for example, "Leyli and Majnun," "Arshin Mal Alan," "Mashadi Ibad" and "Koroghlu." Altogether he wrote 10 operas. This silver vase was sent to him as a gift by some of the progressive cultural figures in Iran on the occasion of his 60th anniversary. As I said, everything in this house has its own history. When Alexander Dumas came to the Caucasus in 1858, he met with Natavan. He was deeply amazed by the way Natavan's husband, Khasay khan Usmiyev, spoke French. He even played chess with Natavan. Natavan gave Dumas some of her embroidery, and Dumas in turn gave Natavan this bust of Napoleon that you see here. Uzeyir bey's father was the first assistant to Natavan and was very close to her family. Many things in our museum related to Natavan were inherited by Uzeyir Hajibeyov from his father. We even have Natavan's mirror here. Also in this museum, you can find the instruments of a number of nationalities of Central Asia and the Caucasus here - Tajik rubab, Azeri tar, Georgian chonguri, an Osetian stringed instrument and other instruments from Uzbekistan and Kyrgyzstan. Did all these belong to Hajibeyov? These were given to him as gifts, just to show that he was very popular in all those regions. When Uzeyir Hajibeyov wrote the music for the national Soviet Azerbaijani anthem in 1944 [not the one that he wrote that was used during Azerbaijan's independence (1918-1920), which has been readopted today as the national hymn], Tajikistan authorities asked Uzeyir bey to write an anthem for them. So they brought him this national Tajik instrument to make it possible for him to take into consideration some of their national motifs. Uzeyir Hajibeyov answered: "True, I have written an anthem for my Republic, but I don't feel comfortable writing one for you. Send your composer to me and I'll help him write one for you." And that's what they did. Our big headache in this museum is that we don't have enough space. It's too small. Even Heydar Aliyev has mentioned that this place is too small for a museum on Hajibeyov. I'm dreaming of enlarging this museum. I need three exposition halls to be able to show his creative activity on a large scale. Usually, when we are looking at the exhibits, there is music playing in the background, the wonderful music of Uzeyir Hajibeyov. The guy who''s in charge of the music went home early today. If you come some other day, you'll hear it. Let me tell you another example of Uzeyir's kindness. I will never forget when they arrested my sister and my son-in-law in 1937-38. My mother remained here alone. I was living in Leningrad at the time, so Uzeyir bey took care of my mother. And when my sister returned from exile, he took her into his home and had her registered as a person living in his house. That was against the law, but he took her into his own custody. She was an oil engineer. After she returned from exile, not only did he give her shelter in his home, but he also arranged for her to get an education in the conservatory. So she graduated from the second university and thanks to Uzeyir Hajibeyov, she got work and earned her own bread by working as a professor. But, of course, I had known Uzeyir from childhood. Every year they would come to Tiflis, and we would all go on holiday to our dacha (summer home) in Georgia. He was so kind in taking care of my family. I've done my best over these years to pay the great debt I owe him. Hajibeyov.com is a website created by Azerbaijan International magazine. Editor: Betty Blair. This interview was translated by Fuad Akhundov and prepared for this web site by Arzu Aghayeva.